The Executive Officers are the ones listed on the List of Officers on the 501c3 and serve as the Executive Board for ATCEV. The Executive Board/Officers are responsible for the nonprofit status and documentation of ATCEV meetings, activities, and duties required to manage a nonprofit organization. The ATCEV Board will consist of the Individual Coalition Executive Directors or their delegate (this includes the Executive Board/Officers) and will be the ones to give consensus on issues for ATCEV. These decisions will be made based on the feedback and consensus from each of their respective coalition board and staff. Each coalition Executive Director or ATCEV delegate will have one vote as a board member of ATCEV. The Member Coalition’s Board and Staff will give feedback to their Executive Director or ATCEV delegate on discussion issues at your coalition meetings. The individual Board’s and staff will be able to have input and discussion and come to consensus with your Executive Director or ATCEV delegate. In turn, the ED will bring that consensus vote to the next level. There will be several types of meetings and calls that will take place. 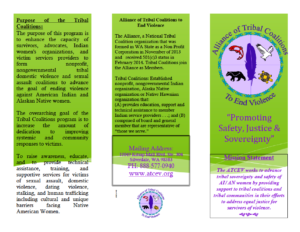 There will be meetings and calls that will be open to the entire ATCEV organization: Tribal Coalitions, their Board, and Staff. These meetings will be to give out general information and have open dialogue as a collective group. This will also include trainings and webinars. There will also be meetings for the ATCEV Executive Board/Officers for the purpose of maintaining the non-profit status and all that entails. Communications may take place via conference call, webinars, meeting services, and in –person, and other shared communication systems. Meetings shall be called by the members of the Board through the Chairperson or the Secretary of the organization. A process for following discussion threads and tracking for consensus decisions will be established. 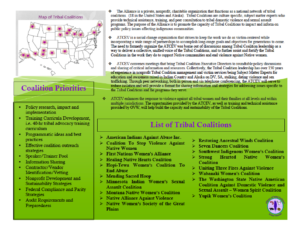 Copyright © 2018 Alliance of Tribal Coalitions To End Violence | Developed by Olympic Web Design, Inc.